gray diy glazing kitchen cabinetsdiy painted furnitureDIY painteGlazing to cabinets is like hot fudge to ice cream, it’s just a perfect combination. Glaze gives that added depth and dimension to otherwise plain painted cabinets. I absolutely love the look of glazed cabinets, it’s sophisticated and elegant and really boosts the overall look of your kitchen. Best of all, it’s easy to do yourself. By definition, glaze is a semi-clear coat that is darker than your paint color. It is applied on top of fresh paint and then wiped off quickly which leaves behind a nice dark outline along edges and details. The best thing about glaze is that it is forgiving and easy to work with. If you mess up, you can wipe it off and try again. There is literally no regrets when working with glaze. So why wait? Let’s get started! 1-It’s best to apply glaze to freshly painted cabinets. This ensures you’re not glazing over old dirt, dust, or grime. If you aren’t planning to paint your cabinets, at least give them a rrreeeaaaallllly good cleaning. Use a degreaser and a liquid sandpaper and allow them to dry completely. It’s best to remove the cabinets off the hinges and remove the hardware completely. 2-Choose a paint that is a lighter color than your desired glaze. The glaze will darken the original color by about 2 shades. You can choose virtually any color/glaze combination. The most popular paint color is white, because the glaze shows up easily to create an antiqued look. You can glaze wood-stained cabinets, colored cabinets, or grey cabinets with dark brown or black glaze. If you choose white paint, make sure you use WATER based paint such as acrylic or latex. Using an oil-based white will result in yellowing over time. Unless of course, you want that antique look. 3-When the cabinets are ready, start glazing by using a rag or paint brush to apply the glaze, it will look messy and a little scary, but don’t worry. This is the hardest part. As soon as you apply the glaze, wipe it off in one direction. The stronger you wipe it off, the less color it will leave on the cabinet. As you wipe the glaze will stick to the corners, edges, and details, giving it that perfect antiqued look. I like to have a partner for this part, so one of us can paint on the glaze, and the other can wipe it off. Glaze dries quickly and darkens slightly over time, so allow it to dry completely before you decide to make it darker. If you aren’t happy with the look, use paint thinner to remove the glaze completely. If necessary, you can use a paint brush to make the glaze appear darker in specific areas. Wipe lightly to blend in with the rest of the cabinet while leaving the color where you want it most. 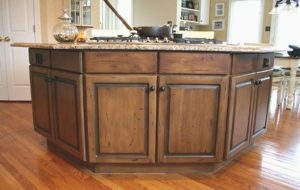 Sealing glazed cabinets is not necessary, but a varnish or laquer finish can help the glaze to last longer and prevent cabinets from looking worn. Only apply a finish after the cabinets are completely dry and let the cabinets cure for 48 hours before applying hardware and reinstalling them. Glazing can transform cabinets like nothing else can. It changes the entire look of a kitchen and takes painted cabinets to a whole new level without spending thousands of dollars on a full remodel. Like always, if you have any questions or suggestions, comment below! 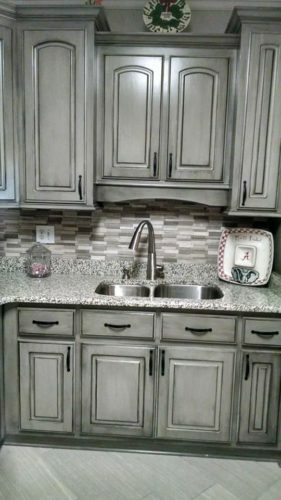 If I wanted to glaze my already white cabinets, what color of glaze would be best to give them more of gray or dark look? A gray glaze would be great for what you are looking for! What brand of glaze do you recommend to use over latex paint? I usually get valspar, since that is the paint brand I usually use. They are water-based. I use Minwax, polycrylic. Good luck with your project! Hi Genevre, I am in the process of stripping all my kitchen cabinets. Wanting to paint them in an oil base antique white (all my wood work in rest of house is antique white, no white in my house) then use an oil base glaze. My question is after I do the glazing do I put an oil base clear coat on top? Some are telling me no because the glaze is oil base. One more question – I want my cabinets to last me for a very long time (I am 66 and don’t want to do this again) so do I use oil base paint or a latex paint? I do know that an oil base paint will yellow with time, just not sure how long it takes. My wood work still looks good and it has been 11 years. Want my cabinets to be durable. I would really appreciate your help for this diy paninter. Feel free to email me too. Sandra, How exciting to have a new look in your kitchen! Yes, I would do a clear coat on top of the glaze. I do a clear coat on everything (except for wax) just to give it the extra protection. Oil paint is more durable than latex, but not by much. There are plenty of laytex paints that are formulated to mimic oil-based paints durability, and dry in 1-2 hours! Oil paint will take 10-12 hrs between coats. Oil paint is also stinker, in that you can’t really eat and sleep in the same area as the paint fumes. Like you mentioned, it does yellow after a few years, depending on how humid your location is and how much sun exposure the cabinets will get. You can have very durable cabinets with latex paint. Do several thin coats (3-4+) more than a couple thick coats, and finish it with 2 coats of your clear top coat. If you have any touch ups, or chips in the future, the laytex is a lot easier to fix. I hope this helps, good luck on your project! What color gray are those cabinets painted? Lisa, I would love to know the names as well. I found this image on Pinterest, however, it has no source. I loved the glazed look so much, I had to add it to my article. Aspen gray with black glaze. This is what I used and love it!! Thank you Angela- the cabinets turned out beautifully! Angela, what brand paint & glaze did you use? Valspar? Anyone ever tried a green latex painted cabinet glazed with a dark blue??? I haven’t but I would imagine that would create a beautiful teal look! Let me know if you try it! Helene, I wish I could tell you the specifics to the gray kitchen, it looks amazing! It is not my personal project though. On step # 2 you stated “ use an oil based paint to glaze”. Will be ok to glaze acrylic enamel? Also, any true glaze, or are there some that are not compatible with acrylic enamel? Would you recommend I use polyurethane on the acrylic enamel in the end? Diane, I will update my article to be more specific. Yes, you can use oil or acrylic/water-based paints to glaze. Just make sure that your glaze matches the same medium. If you use a oil paint, you need an oil-based glaze. If painting with latex or acrylic make sure to use a water based glaze, with a water-based topcoat, such as your polyurethane. If you are painting with white, you MUST use a water-based paint and glaze, to avoid yellowing over time. Thanks for your question, I wish you the best of luck on your project! After I glazed my cabinets the glaze is all cracked up what can I do to fix it… Any ideas?? You can sure try to fix it. 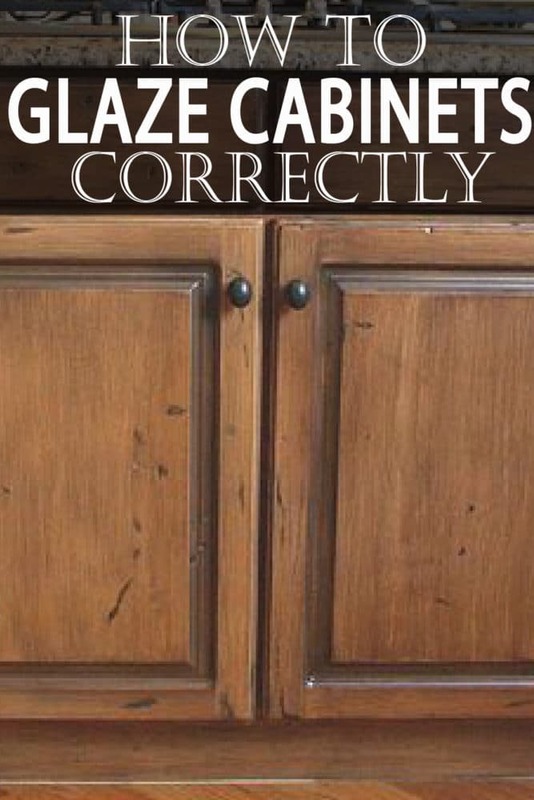 Clean your cabinet, sand down the cracked area, and then fill the seam with a paintable acrylic caulk. Chalk shrinks as is dries so a few coats may be required depending on how large the cracks are. Sand it to smooth the surface, then you can repaint it. 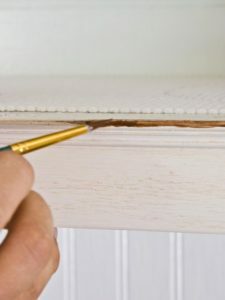 If you have many cracks all over your cabinets, it would be best to strip off the paint and just start over. In the future, make sure you use a true glaze, not an opaque glaze- which contains paint and acts more like paint than a glaze, cracking and peeling with temperature changes. Also, the temperature and humidity levels of the area you live in can create large cracks, so try to maintain a consistent temperature in your home. Can I use glaze over acrilic painted kitchen cabinets? I have maple cabinets that I want to go darker with. Which would be better gel stain or a glaze? Open to suggestions. Elaine, both gel stain or glaze will do the trick. Glaze sits on the surface, and gel stain will penetrate the wood and really soak in. Personally, I would use a stain for a more permanent makeover. So the order is paint, glaze, then poly? Can I put the glaze over satin paint? You can apply glaze over paint, but not over stain. A stain is oil based and will not allow the glaze to adhere since it is water based. You could “stain” your wood using a water-based paint, and then you can glaze over it. Check out my article on How to whitewash to learn how to use any paint as a stain. Is glazing possible with chalk painted cabinets if the cabinets are sealed with polyacrylic? No, If your cabinets are already sealed, the glaze will not adhere to the cabinets. You might get an overall darker look to them, but no glaze will get in the grooves of the wood. what color glaze did you use on the last photo, i am assuming over white paint? Lisa, I didn’t refinish that last picture, I found it on pinterest and just had to add it to my article. The author is unknown, but it was painted with Valspar Aspen Gray, glazed in black. Hi Genevre! I have solid maple custom cabinets and after 20 years I’m ready for a slight change. Is there a technique that I could use to put a white glaze on my cabinets? I want to tone down the golden color and update them to a whitewash or glaze or something lighter. I love all you fix ’em uppers. Any suggestions are appreciated. Bennie, yes you can apply a glaze to your cabinets! Maple has a naturally buttery color, if you want to remove all the golden color you will need to repaint them a solid color and then glaze them. If you don’t mind the golden look but want to tone it down, a white glaze would be perfect. If you are unsure of what you want, I would get a maple sample piece of wood from a local hardware store and try several different colors and glazes. Once you decide what you want to do, test the inside of your cupboard to make sure it is what you want. You can also learn more tips with this article Good luck on your DIY project!